Bono is serious. For their second performance of ‘Vertigo’ of the night, he walks over to the drum kit to ask Larry Mullen how to say 14 ‘as Gaeilge’. Misunderstanding, Larry shouts: ‘A h-aon’! (‘one’) Bono asks again and this time the drummer gets it right: ‘Ceathar déag’. Three times he tells Bono how to say it. Close enough. With an apology to the venue’s local neighbours because the show ran 10 minutes past the 11pm curfew, the band tear up the song something wicked. (They might as well skip the first time they play it at the start of the show.) The place is alight, and all around us kids’ faces are in ecstasy. Croke Park sings along as they have done all night. The European leg of the Vertigo Tour has officially got lift off. While the first two shows in Brussels and Gelsenkirchen left us a little indifferent and having missed the reportedly better gigs in the U.K., Croke Park I has it all. Drive, energy, emotion and fun – this time the boys were truly back in town. There were, as expected, few real surprises in the setlist (Wild Horses, With or Without You, I Will Follow), but the passion, the Irish banter (Bono mentioned the Irish poet John Keats when he noticed a banner in the audience that said ‘see you in Rome’) and various ‘new’ snippets like Thin Lizzy’s ‘Jailbreak’ and an improvisational ‘Northside in the Rain’ well made up for that. Talking about the rain… Bono sang some lines of it, twice during the show. 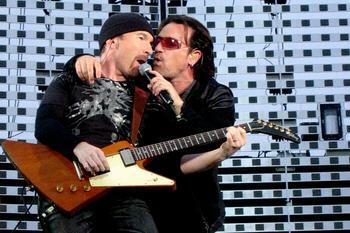 ‘Oh, you look so beautiful tonight,’ Bono told the Croke Park audience. Absolutely gorgeous, yes. stadium. My neighbour started queing at 9 am and managed to get into the bomb shelter. He thought it was the best show on the UK / Ireland leg tour so far. I didn’t bother going in till 7PM which was just as well. The Gardai made me move my car from outside my house. There was another car nearby and they had it towed. Also had a laugh as the kids from the flats started protesting with chants of ‘We Hate the GAA ( Gaelic Athlethic Assoc / Grab All Assoc.) and We Hate Bono’. They were protesting because their area didn’t get any resident passes to the shows. Watched Paul McG on the 6 oclock news. He said the band are considering bringing the show outdoor in America next year. It took a good 40 mins for the crowd around me to warm up. Once it did the place caught fire. Highlight was watching everyone take out there mobile phones. By Coincidence it turns out that we Irish spend more money on texting in Europe than anywhere else. Personally I thought the show in Scotland was better but this one came close and was definatly much better than both London shows. I was working until 3:30 that day in and around Croke Park which was not to my liking. I thought I would be miles away from the stage but somehow I ended being right at the top where the people who had queued since 9 a.m were. The top of the standing crowd was full of foreigners from Germany to Morocco. This was bad in a way because when the Radiators came on there was no support for them although they were rubbish. But what angered me was that there wasn’t good crowd participation when Snow Patrol came on, who were brilliant by the way. Then at 9pm U2 just casually walked on stage and then kicked into Vertigo. The crowd was full at this stage and the atmosphere totally changed. Everyone sang along to their songs. My favourite performance of the night is between Sunday, Bloody Sunday and City of Blinding Lights. Excellent concert and the stage was magnificent aswell. Finished at 11:15 p.m and was the best 60 euro I’ve ever spent. Came over Thursday from the UK after not seeing U2 since 1993 at Wembley. I was worried I was going to be disapointed but needed have been. Absolutely beyond doubt the best night ever. all the best hits from Streets to the latest City of Blinding lights which was.. BLINDING!. Shame they didnt play desire or bad but there you go. A bit of rain but everyone in great spirits. 3 rows from the front too – better than I could have hoped for. Outstanding. Without doubt the best band of the last 20 years. Darren Lee, in our section it was us, two Dutch women, singing along to the Radiators songs, while the Irish kids had no idea who they were. I was rooting for them to play Under Cleary’s Clock, but was just as happy with Kitty Rickets. I work 10 minutes from Croke Park. I was indeed surprised to walk in to Croke Park at 5:00 on Friday and get straight in to the pit. I did feel extremely guilty seeing as I had passed several Mexican/Spanish/Italian fans the previous day queueing to get to the front of the pitch. This has been my 5th time seeing U2. Each time I have been in the pit. Hope you all enjoyed the gig in Croke Park. I’m a regular visitor to it for GAA matches. If any of our foreign friends are over again, then do check out a match in Croke Park. Extremely entertaining! Radiators were brilliant. Great to hear all the old songs again ang the new gems were a bonus. Sorry about the misspelling (that was Scots Gaelic). I got into the pit, best night ever. I thought it was great the way he got the point across about poverty during the concert, loads of people complained about it, but theres always critics.